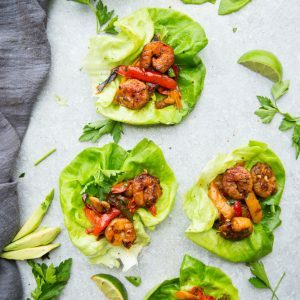 Shrimp Fajita Lettuce Wraps - fresh, flavorful and a healthier way to enjoy fajitas! Less than 30 minutes to make and perfect for lunch or a lightened up dinner for busy weeknights! Combine the paprika, oregano, cumin, garlic powder, salt and pepper in a small bowl. Pour half of the seasoning, ½ tablespoon lime juice and 1 tablespoon cilantro over shrimp. Toss to coat. In a medium skillet, heat half tablespoon of butter over medium-high heat. Add shrimp and cook until golden and opaque, about 2 – 4 minutes. Transfer to a plate and set aside. Melt the remaining half tablespoon butter in the same skillet. Add the sliced onions and cook for a minute, until fragrant. Add the bell peppers and remaining seasonings and cook for another 2-4 minutes or until desired tenderness. Return cooked shrimp back to the pan and add remaining lime juice and chopped cilantro. Toss to coat and remove from heat. Assemble lettuce wraps by placing a spoonful of shrimp/vegetable filling into the center of each leaf. Top with avocado or your favorite toppings.